With European settlement in the Hawkesbury stretching back over 200 years it's no surprise that the area has many historic churches. 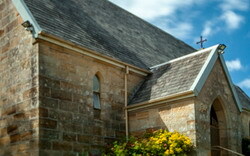 The oldest church in Australia is at Ebenezer and there are many others of architectural significance. The listing below includes some of the most historically significant churches in the Hawkesbury. If you are doing any family research the following cemetery registers and resources should also assist. Built in 1809, Ebenezer Church is the oldest existing church in Australia and it became the first Presbyterian Church in Australia in 1824. It was a pioneer in education in the colony, beginning a school in 1810. 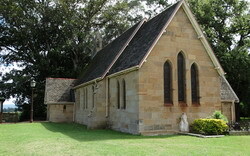 The church is the oldest existing school building in Australia. 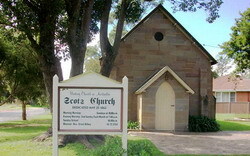 Ebenezer Church overlooks the Hawkesbury River in a rural bushland area that is 12km from the township of Windsor. The Schoolmaster’s House is a two-storey sandstone building, constructed in 1817 as a residence for the teacher and is now open for Devonshire teas and coffees. The first burial was in 1812; the cemetery is one of the most important in Australia with six generations buried in its grounds, including some of the first free settlers in the colony. This masterpiece designed by convict architect Francis Greenway was built on a site selected specifically by Governor Lachlan Macquarie and is one of the most beautiful buildings in Australia. The corner stone was laid by Governor Macquarie in October 1817 and the building was consecrated in December 1822. 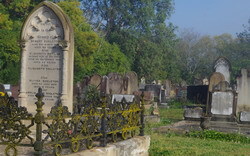 The burial ground surrounding the church pre-dates the church and includes graves of such notable people as Andrew Thompson (enterprising ex-convict and friend to Macquarie), Dr Thomas Arndell, William Cox, John Tebbutt and Capt. John Brabyn. This church’s foundation stone was blessed by Archbishop Bede Polding on 28 December 1836. The building was completed with the assistance of a bequest from James Doyle, together with public subscriptions, and was officially opened on 21 October 1840. 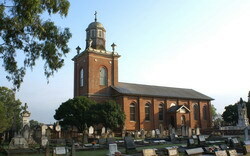 The Windsor Catholic Cemetery, on the corner of George Street and Hawkesbury Valley Way, is one of the earliest burial grounds in Australia, having been promised to the Catholic Church by Governor Macquarie in 1821. With over 80 interments taking place by 1837, there remain several fine examples of the stone carver’s craft as well as the graves of notable citizens such as James Doyle, members of the prosperous McQuade family, and Eliza Wilson who was the only fatality from the Great Fire in 1874. On 3 December 1810 Governor Lachlan Macquarie determined the location for Richmond’s future church, schoolhouse and burial ground. Building began about 1837 and it was consecrated by Bishop Grant Broughton in 1841. The church was designed by colonial architect Francis Clarke in the colonial Georgian style and constructed by local builder James Atkinson using bricks which would have been made locally by hand. The cemetery across from the church was in use by 1811. Many notable citizens are buried here, including Margaret Catchpole and Louisa Calvert (née Atkinson), as well as members of the Cox, Bowman, Pitt, Onus, Town, and Boughton families. Next to the cemetery is the Gothic inspired Sunday School Hall, built in the 1870s. Church services were possibly held in the Pitt Town locality from the early 1800s however it was not until the 1820s that a purpose built building was established. 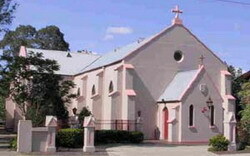 The foundation stone of the present church was laid in 1857 by the Lord Bishop of Sydney. The Victorian Gothic Revival style sandstone church, designed by architect Edmund Blacket and constructed by Thomas Collison, was completed in 1858 and officially consecrated by Bishop Barker on 11 April 1859. The foundation stone was laid on 17 December 1856 but it was not until 12 April 1859 that this simple Gothic building of Hawkesbury sandstone was consecrated by Bishop Barker. On the north wall of the church is an interesting vertical sundial which tells the time with reasonable accuracy. 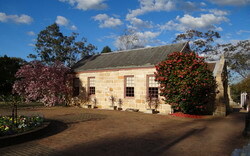 The schoolhouse is the only one remaining of the four ordered by Governor Lachlan Macquarie. The lower floor was the schoolmaster's residence whilst the large upstairs room was a schoolroom on weekdays and used for church services on Sundays, until the church was built. It remained in use as a school until 1880 and is now used by the Sunday School. The burial ground is situated at the rear of the schoolhouse and includes graves of still familiar names including Cobcroft, Greentree, Farlow, Beacroft, Izard, Dunstan, Turnbull, Bowd, Gosper, Stubbs and Rose. This Victorian Gothic Revival style church was built in 1860 as a Presbyterian church and was consecrated in 1862. Prior to that time a room belonging to William Hall was used for services. Hall left a 50 acre farm and a bequest of £100 to the church allowing the construction of the present building. Stone for the church was quarried locally at the Longneck Lagoon Quarry. In the yard to the south is the grave of Reverend David Moore, his wife Annie Cooper and their daughter Annie. The grave is marked by a fine arched sandstone monument and is surrounded by a low iron picket fence.